I would like to warn anyone viewing this page that some of the video content can appear quite brutal, all the videos with the Bullet Men are stress test training, therefore, they are supposed to be as near to a real life experience as possible, although I would like to assure everyone that these are done in very controlled conditions to ensure everyone's safety. was searching for a practical and effective Martial Art, his first Martial art was Ju Jitsu and even though he found it enjoyable, Eddie still felt there was something missing in his training, after reading about Muay Thai in a couple of Martial Arts magazines Eddie set about learning this highly Devastating Martial Art. After reading an interview with Bob Spour in Combat magazine, Eddie tracked Bob down and the love affair with Muay Thai began, Eddie got his 10th khan (black belt equivalent) in 1995, was awarded Senior Instructor grade in 1997 and in 2008 was awarded the title of Arjarn which translates from Thai to English as Master. Eddie has been coaching since 1998 and is known as one of the UK's leading martial arts instructors. He has a wealth of knowledge in not only Muay Thai but Malaysian and Indonesian Silat, Filipino Eskrima, Russian Sambo Wrestling, Western Boxing and Japanese Ju Jitsu. 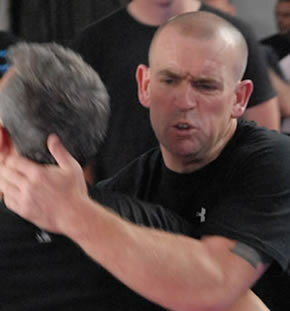 Eddie is also a senior instructor for the Ultimate Self Protection group and is founder of THE APPROACH a hard hitting, and easy to learn principle based self-protection concept from Eddies extensive training in the South East Asian Martial Arts. The use of elbows, forearms, hammer fists, knees, shins hitting the body all done with forward energy, correct body alignment and body mechanics, with no passive movement makes THE APPROACH a formidable way of fighting. There are only a few stages that make up THE APPROACH, the first and arguably the best is the use of the forearm, you might be wondering if the use of the forearm is to block or attack? The answer is that there is no blocks, no defence, always attack, always in combination, often simultaneous. One of the main principles in Silat Fitrah is there is no passive movement, so your defence is to attack. Please click here to see the videos of Andy and Jason with the Bullet Men, as mentioned above, these are stress training situations and can appear aggressive, although they are done in a controlled environment, I would recommend that parents view these videos prior to allowing their children to watch. 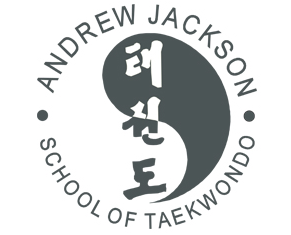 Please click here to see our training on The Approach Self Protection Method at my Do Jang.